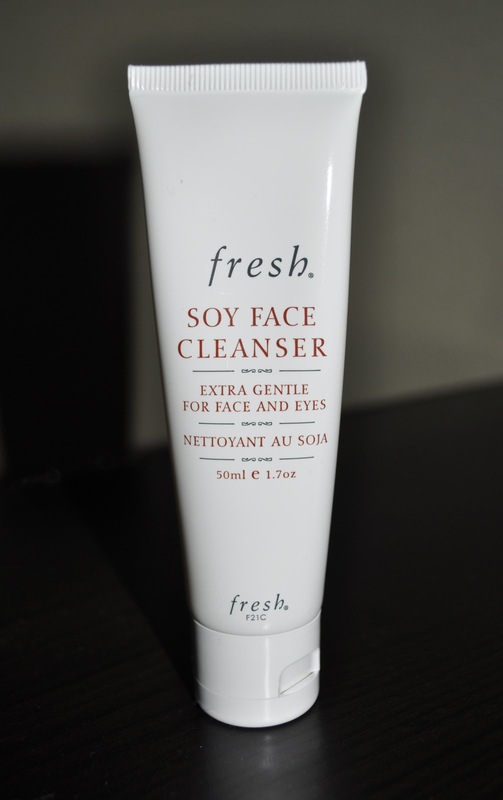 Today's post will be a review of the Soy Face Cleanser by Fresh. For starters, I want to state that I have normal to dry to extremely dry (during the winter season) skin. I've never had a problem with acne, breakouts, etc; my main concerns have always been to keep my skin moisturized and hydrated. During my last trip to the states, I visited my local Sephora and spotted this 1.7 oz tube while I was waiting in line to make my purchase (I've always found it clever(and sneaky) of Sephora to have the travel size products displayed along the checkout line, just in case they haven't gotten enough of your money). "This extra gentle formula delicately cleanses the skin, is safe to use around the eye area, and removes all makeup (even mascara)". Now, I never solely rely on a cleanser to remove my makeup. I also use two makeup removers, one for the face and the other for the eyes (lets not be lazy folks, our skin is our greatest asset) before I wash my face. "Soy Face Cleanser contains a high concentration of soy proteins packed with amino acids and antioxidants. The mild composition is enhanced with pure extracts of rose, cornflower, mallow, aloe vera, cucumber and ginseng. These natural extracts help to tone, soothe, and reduce dryness. Recommended for all skin types". Normally, I wouldn't review a skincare product until at least a month of use, but I can't see myself using this product any longer then for the one week I've been using it. Soy Face Cleanser has a gel like consistency and once mixed with water, it has minimal lather. After washing my face, I wasn't left with the feeling of refreshed, cleaned, soothing skin but instead I had this odd velvety I know it's clean veil on the skin. I've washed my face twice today to try to better explain this but I just can't put my finger on it (I'm blaming the medications the doctor gave me for my cold). This is an extremely gentle cleanser and fairly decent. During the one week of use, Soy Face Cleanser did not leave my skin feeling dry nor tight (bonus in that department). What sets this product back is the smell. Soy Face cleanser smells just like pickle juice with a hint of roses...not a scent I would not associate with feeling clean. As soon as I applied the cleanser onto my face, I was quickly washing it off to get rid of the smell; don't get me wrong, the scent doesn't linger on the hands or face for very long but the smell of this toxic concoction is repulsive enough for me not to want it on my face for more than 10 seconds. I paid $15 for the 1.7 oz tube, and boy do I thank my lucky stars that I didn't purchase the fill size(5.1 oz) for $38. Fresh's Soy Face Cleanser is an average cleanser with a price that is not justifiable. There are far better cleansers in the market that I don't see the need in continued use and torturing myself with the fragrance. Soy Face Cleanser doesn't smell to fresh but rather rancid and I will never buy this product nor recommend it! !